One of the secrets to promoting any product or service is becoming a pro at using multiple channels of communication for that product or service in delivering the marketing or promotional message to the customer. In this sense, I am speaking about potential EAP clients (employees or work units) within the organization that can take advantage of your services. Increasing your EAP utilization or marketing EAP services effectively requires analyzing and studying these channels of communication and keeping your eyes open for new ones as they pop up. You may spot one at any moment as it produces an EAP client. That’s a signal to grab it, stick it in your marketing basket, and add it to your marketing mix. A focused discussion with your staff can produce more through a brainstorming process, but arriving at the point where your antenna go up with "Marketing Channel, Alert! Alert! ", is the place you need to eventually arrive. If you worry about your EAP utilization, the answer to increasing it off the charts lies in examining, tracking, and exploiting these marketing channels. Putting pen to paper to identify them and work them strategically can boost your utilization rate, reduce behavioral risk exposure in the organization, and provide evidence to prospective EAP corporate customers that expertise in your craft is going to return big bucks to them in cost-benefit if they go with your proposal. It may also prevent your EAP from closing its doors or getting farmed out to an 800 number in a cubicle on the 24th floor of an office building on the other side of the country. Understanding marketing channels is not only an art, but an essential strategic undertaking in the survival and growth of your EAP. You are already very familiar with one or two channels of communication that apply to your employee assistance program. 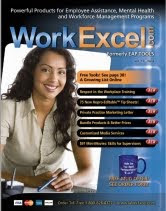 One no-brainer is the EAP brochure distributed in strategic locations within the organization. 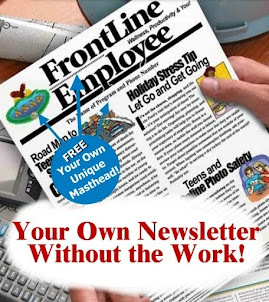 Another channel is your health and productivity, or work-life newsletter given to employees at a frequency decent enough that you are actually remembered. And still another is making short presentations on mental health or work-life topics. There may be 20 to 30, and even more marketing channels that escape your awareness, yet each may potentially contribute to a higher EAP utilization. You should identify these channels of communication so you can work them to your advantage. If you do not make a focused effort on doing this, you can easily miss half of them. 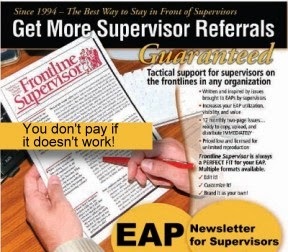 Channels of communication reinforce each other and each contributes to increasing or maintaining your EAP's utilization. In the next few messages, I will begin discussing a few of these with the goal of helping you establish a 6th sense for spotting these gems and mining them for the benefit of your EAP, corporate customers, and most important troubled employees.